Research has found that snacking is the fastest-growing meal occasion in Canada. 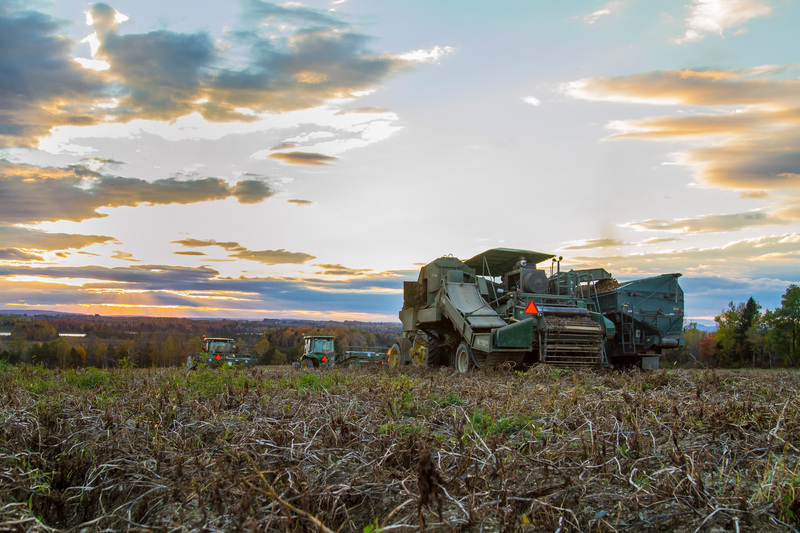 Potato harvest at Covered Bridge farm in the Saint John River Valley in Heartland, New Brunswick. The great food writer M.F.K. Fisher had a particular fondness for potato chips. It’s not that she only ate the best—on the contrary, when describing the batch that catalyzed her passion, she summoned a somewhat unappealing memory of chips unevenly fried, oversalted, and smelling faintly of chicken or fish. Yet something indescribable about these “vulgar fried potatoes” sent Fisher into a kind of appreciative reverie so strong, she claimed to have felt sufficiently sated by her mere recollection of it whenever tempted by packaged chips. 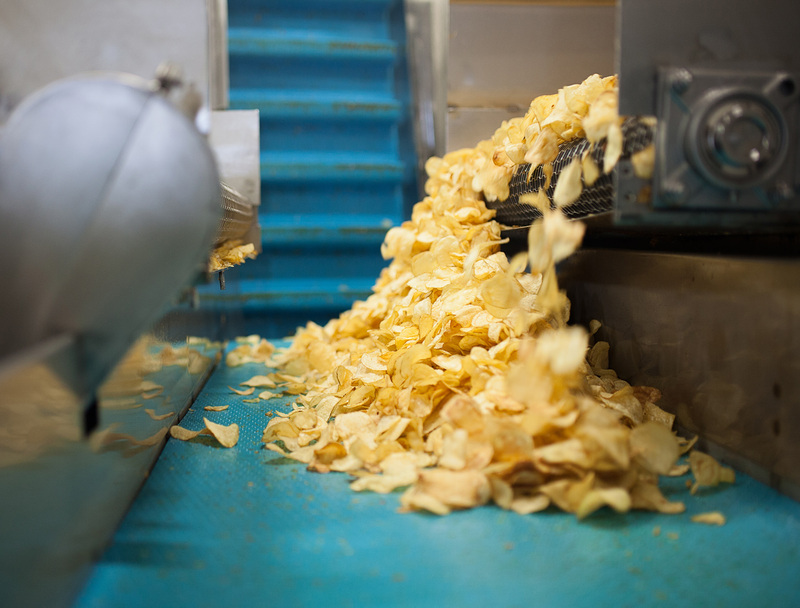 Touring the Hardbite potato chip factory in Surrey, B.C., where before my eyes thousands of local spuds are sliced, fried, and ferried, hot and glistening, along conveyor belts toward a bagging machine, I don’t have her restraint. Hardbite president Kirk Homenick hands me a bag fresh off the production line and it’s finished before I’m halfway home. My weakness for chips is hardly unique. Research has found that snacking is the fastest-growing meal occasion in Canada, with chip consumption steadily rising (on average, we each eat three kilograms of chips a year, if you’re wondering). Yet despite this fondness for chips and our formidable potato industry, Canada has precious few of its own potato chip producers; even the omnipresent, Manitoba-born Old Dutch line is now owned by a Minnesota family. Those we do have, however, are next-generation snack world upstarts capitalizing on their location and carving out a niche in a market otherwise dominated by impersonal multinational brands. One such company is Hardbite, which was founded in 1998 and has been operated by its current team for seven years, during which business doubled. The company’s success primarily hinges on the fact that it makes a mean chip. Free of GMOs and gluten, the potatoes are kettle cooked in sunflower oil (with an upcoming avocado oil–fried line) at a slightly cooler-than-average temperature for a slightly longer-than-average time, resulting in hearty crunch bombs with plenty of textural variation per bag. Flavours are classic and considered, selected through an intensive vetting process that sees two new tastes out of 50 hopefuls debut each year (on the horizon: honey Dijon and a spicy-sweet ghost pepper chip; on the cutting room floor: birthday cake, goat cheese, and pumpkin spice). The company also makes a line of root vegetable chips—mixed bags of fried sweet potatoes, beets, parsnips, and carrots. But the 45-person outfit’s impressive growth is largely due to a creative rebrand that saw the snack food effectively position itself adjacent to—if not a healthy part of—an active, outdoorsy lifestyle, with a bag design featuring photos of the Pacific Northwest and an Instagram page managed by a local adventurer, who posts images of the chips stashed in canoes and around campfires with the hashtag “#AllPotatoNoCouch”. “We think that the snack is about enjoying life, and so is climbing a mountain or hiking a trail,” says Homenick. 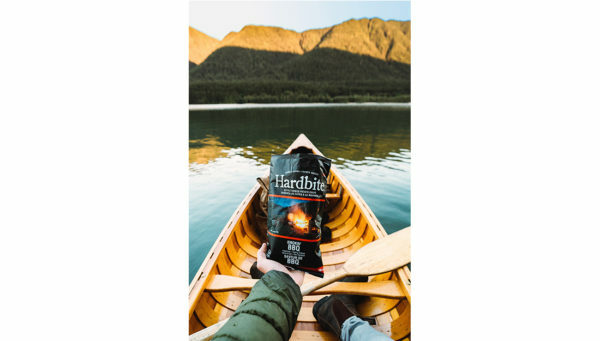 “We’ve seen a bump in demand for our product outside traditional grocery stores—people want to buy us at convenience stores and coffee shops for on-the-go snacking because we’re seeing a consumer who is out in the world exploring.” Hardbite projects an aspirational vision of Canadian life—camping under summer skies, jumping into lakes, pausing to take in mountain views, all with a locally made snack in hand. Ripping open a bag of potato chips is always gratifying, and that satisfaction is only amplified by the knowledge that your snack supports Canadian businesses and farms. That these chips also taste amazing is enough to send you into a reverie of your own.